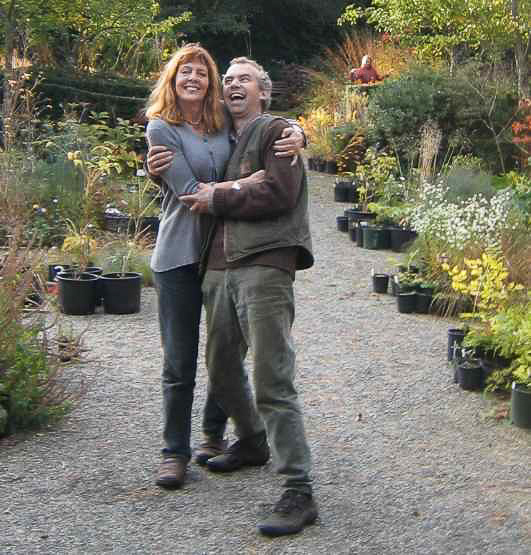 About Us – Free Spirit Nursery Inc.
Our gardens are brimming with perennials, woodland plants, ornamental grasses, ferns, vines and companion shrubs which create an ever changing medley of shapes, colors, scents and moods. The retail display is set up in a way that you can view the plants in borders on one side of the pathway while finding the same plants for sale in pots, opposite the example, on the other side of the path. This way you can see exactly how this plant-in-the-pot will become and also with which plants it combines well. Visitors find this to be a very inspiring and helpful way to assist them in making the right choices for their own gardens. Luckily, our property in South Langley is still dotted with the remnants of our beautiful West Coast forests with larger fir trees, huckleberries and sword ferns. Over the years we have developed a particular affinity for woodland plants which can grow happily in their shade. We have devoted our sunny areas to a naturalistic garden style by blending all kinds of different good perennials with ornamental grasses. In the shade or in the sun, we mix in plenty of North American native plants so our gardens blend into the natural background of those firs and cedar trees. Finally, some of the genera and plant groups that have our particular interest are Anemone, species Clematis, Epimediums (and other herbaceous Berberidaceae), Helleborus, Sanguisorba, Thalictrum and Umbellifers. Please check our opening times and days and we look forward to your visit to Free Spirit Nursery!